It seems impossible, but it’s true: the Hideaway 12 is even brighter than the Hideaway 8 because 4 more high tech 3 Watt Generation IV LEDs have been squeezed into the space that previously held 8. As always, ETD offers the newest cutting-edge technology to its customers as soon as it is available. The Hideaway 12 Tall is identical to the Slim, except the lense is designed to stand higher. 36 Watts of intensely bright light can either synchronize or alternate with 20 other lights in single, double, Triple, Quad….patterns. 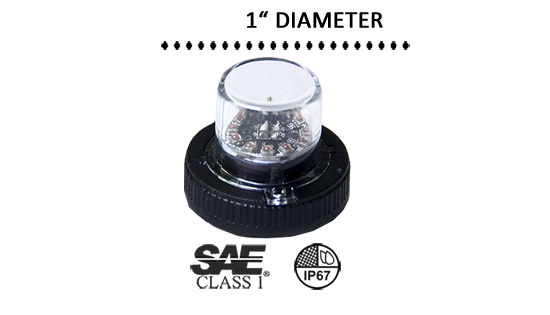 The Hideaway Series takes the place of older style strobe tube kits and uses LEDs that last 100,000 hours, instead of Xenon gas. If you do undercover work, the Hideaway 12 is perfect for stealth work because there is no hint of the unit being a surveillance vehicle; the Hideaway lights are mounted in the tail lights or headlights as close to the focal point of manufacturers’ lights as possible. It has 19 flash patterns with pattern memory; the built-in flasher is on the 15’ power cord. You have the choice from 5 solid or 7 split-color combinations. Hideaways are also surface mount lights, but because they are so small are not really noticed, so even on the surface they are great undercover police lights. The aluminum housing and polycarbonate lens make it possible to put them anywhere that is flat on your vehicle no matter how low. They won’t crack or break! Whether you install the Hideaway Tall or have an EVT do it, your vehicle will have the least visible but most powerful emergency light on the market today of a light this small; it’s 1” in diameter producing 36 Watts! Nothing is smaller with so many functions. If the Hideaway 12’s are the only light you’ll have, then you need to buy a switch as well because they are usually hardwired to an existing system. If you have any questions, contact us on the ETD site, or you’ll find us on your favorite social media platform. We are ready to help you all along the way to purchase just the light you need for the job that needs doing!